NEW YORK, New York, April 4, 2013 (ENS) – NBA Cares Green Week starts today for all teams in the National Basketball Association, with community greening projects, cell phone recycling, green giveaways, adidas green on-court apparel and auctions to encourage fans to go green. Green Week is presented by Sprint and hosted in collaboration with the Natural Resources Defense Council, NRDC. Continuing through April 12, this is the fifth year for the league-wide Green Week. During NBA Green Week, adidas will outfit all players with 100 percent organic cotton shooting shirts that fans can buy at NBAStore.com and at the NBA Store on New York’s Fifth Avenue. Players will wear NBA Green headbands and wristbands made from 45 percent organic cotton, while NBA coaches and broadcasters will wear NBA Green lapel pins, all in an effort to raise awareness. As part of Green Week, the NBA is launching Mosaic, an on-line tool for measuring the environmental impact of each venue and each of the league’s 30 teams. In partnership with NRDC and Renewable Choice Energy, Mosaic will allow all NBA teams and venues to track, analyze, and identify cost savings opportunities within their environmental footprint. The new environmental data gathering system is intended to improve the way NBA arenas are managed throughout the country. At first, four categories of environmental data will be collected – energy use, including total energy used, sources of energy, and use of renewable energy; waste generation, including total waste generated, materials diverted for recycling and composting; water use, including amount of water used and water conserved, and paper procurement, including the amount of recycled paper used in club offices, in stadium restrooms and for yearbooks, game-day programs and media guides. The league will work with Sterling Planet to offset the amount of electricity used during all 67 NBA games taking place during Green Week. Sterling Planet offers a portfolio of renewable energy certificates and carbon offsets. The NBA commitment is expected to result in a carbon avoidance of more than 10 million pounds – one of the largest pollution offset initiatives by any sports league worldwide, and the only one to involve every team in the league. NBA teams across the league will host in-arena nights along with a variety of events and activities in the community to support environmental protection. The NBA and Sprint are launching “Pledge to Recycle,” a fan contest that starts today and continues through May 16. Fans who pledge to recycle their old mobile devices can enter to win a grand prize trip for two to the 2013 Finals. Fans can learn more at NBA.com/SprintPledge. During Green Week, the NBA and Sprint will encourage fans to participate in wireless device recycling events hosted by current and former NBA players in three NBA cities – Los Angeles (Clippers), Boston (Celtics), and Orlando (Magic). As part of the Sprint Buyback program, fans can recycle their eligible phones from any carrier and receive up to a $300 service credit from Sprint, along with autographs, tickets to upcoming games, and other giveaways. Through this program, Sprint, which ranks third on the “Newsweek” list of the 500 greenest companies in America, has kept more than 28 million wireless devices out of landfills. 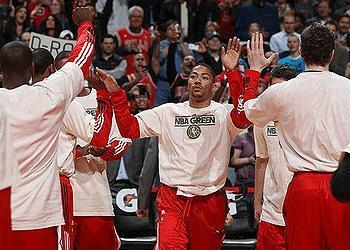 NBA Green is a year-round program that NBA teams are using to identify and implement environmentally sound practices. To date, five NBA team arenas have received Leadership in Energy and Environmental Design (LEED) certification by the U.S. Green Building Council – Philips Arena (Atlanta Hawks), AmericanAirlines Arena (Miami Heat), Rose Garden Arena (Portland Trail Blazers), Toyota Center (Houston Rockets), and Amway Center (Orlando Magic). Five NBA teams have installed solar panels on their arenas, garages, or practice facilities: the Golden State Warriors’ practice facility, the US Airways Center (Phoenix Suns), STAPLES Center (Los Angeles Clippers and Lakers), the Denver Nuggets’ Pepsi Center, and the San Antonio Spurs’ AT&T Center. In September 2009, the Minnesota Timberwolves installed a green roof on the Target Center, making it the first green roof on any North America arena and currently the nation’s fifth-largest. The NBA and Womens’ NBA are members of the Green Sports Alliance, a nonprofit organization that launched in 2011 with a mission to reduce the environmental impact of professional sports and to inspire fans to join in these efforts. Participants include the Cleveland Cavaliers, Philadelphia 76ers, Portland Trail Blazers, Seattle Storm, Toronto Raptors and the NBA league office.